Tom Sakai, Daniel Krasner, Richard Piotrowski, Len and Sarah Lochmiller, and I climbed Mt. Russell by a way I have been thinking about for years. If it isn't the most direct and minimum-energy route from the North Fork of Lone Pine Creek, I don't know what is. We left camp at Upper Boy Scout Lake and ascended the drainage to the northwest which heads directly for the Southeast Face of Mt. Russell. The first half of this pretty valley has grassy meadows, waterfalls, and a small lake which dries up in late summer. Getting to within a couple of hundred feet of the headwall at its end, we climbed up and right until above the headwall, then headed left across the base of the Southeast Face for the Sierra Crest. As I had thought would be the case, this was pretty much all class 2 and on good terrain. Crossing the Sierra Crest into the Arctic Lake drainage at almost precisely 13,000 feet (we called it Lazy L Col because of its shape) quickly placed us in the broad couloir next to the Fishhook Arete that leads up to Russell's South Face. We ascended the nice class 3 right side described in R. J. Secor's guidebook, gained the summit ridge, and walked over to the true summit. There are three pieces to this route. 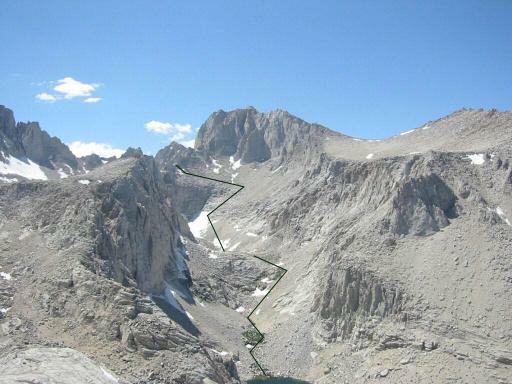 (1) is the drainage ascent to the Southeast Face; (2) is the traverse under the Southeast Face, over the Sierra Crest, and into the broad couloir; and (3) is the climb from there to the summit. (1) has been traveled by many people on their way to Russell-Carillon Pass, and (3) is a very popular finish route to the summit. (2) is an obvious connection between them, but Secor told me he hadn't heard of anyone having done it. That's surprising. I bet people have done it but haven't reported it. Of course, once crossing the Crest, access to the Fishhook Arete and other Russell South Face routes is immediate, and this way avoids the roundabout way to East Face Lake and up and down Whitney-Russell Col.
We traveled leisurely, and it took 10 hours from the time we started up from camp until we got down to Whitney Portal.